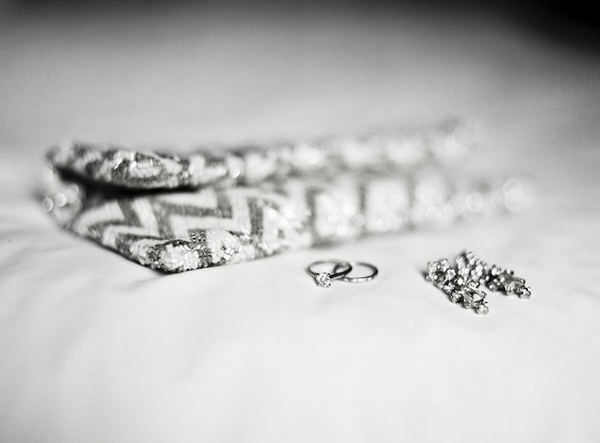 A beaded chevron clutch, the loveliest pair of crystal earrings and a breathtakingly simple set of rings-I love the sophisticated sparkle! This weekend was as jam-packed as it was delightful; John and I left school and the office at normal hours on Friday afternoon so we could enjoy our guests, tacos and each other. I made the trek down to Mountain View with him bright and early Saturday morning for a lesson which we wisely followed up with a long lunch at John's favorite spot, Hayes and Kebab. We learned to shuck our own oysters on Saturday night; they were the perfect appetizer, along with a plate of cheeses and soppressata, for a gorgeous paella full of chorizo, bay scallops, shrimp and squid. After more Mediterranean food for brunch on Sunday, my dear friend Becky, who's staying with us while she house hunts in San Francisco, and I caught up and enjoyed the gorgeous San Francisco weather while John logged hours in the practice room. A simple supper and an early bedtime was just what we needed to tackle Monday morning! What were you up to this weekend–late dinners, afternoon cocktails or finding a new favorite neighborhood? I'm pretty sure everything should have either chevron or some sparkle, so this clutch is kind of overwhelming in how perfect it is! :) Your weekend sounds like it was wonderful, and I hope the week ahead is just as good! I'm not usually one to swoon over purses, but that clutch is so cute. Wow, that clutch is beyond fabulous!! As always, your weekend sounds like it was absolutely delighful! Mine was spent driving my kiddies to 5 different birthday parties (yes, that's right, I said 5!) but I still got a chance to sink my teeth into a new book called "Flapper' that delves into the Jazz Age, a little Fitzgerald, the roaring 20's and the women who epitomized the flapper. Really fascinating stuff!! That purse is amazing! I have such a thing for chevron at the moment! Soppressata & Cheese makes me weak in the knees!! !LOve Love that fab sparkly clutch!! yum- love mediterranean food! sounds like a wonderful weekend!! What a gorg clutch, I am smitten! We seriously need to get together and just eat. I cannot believe you always eat so well! Have you been to Mediterranie? There's a few of them but the best one is in Castro. It's my favorite place to go in the city. Wow...that clutch! Your meals sound amazing! That picture is a DREAM!! What a fun weekend you had! I was at a wedding in Ohio and it was amazing. Lots of drinks, though, which are really hindering my Monday haha. oooh I just love that clutch!! Girl I'm horrified to admit I spent Friday night in the Chef's lounge where 3 female strippers showed up late, kinda tossed up, and tried to get me to go for a night on the town with them. Have you ever tried to keep a look of horror off your face?? HALP! I would have loved to hide behind that chevron clutch. Wow, I am pretty much in love with that clutch!! What a great weekend! We took it easy, ate pho, took naps, and enjoyed the Little Dude. Glad you had a good one, too! simple and effective accessories! looks perfect!! And glad to hear you had a lovely weekend! Sounds like you had a lovely weekend! PS..the clutch, rings and earrings are gorg! Lovely, indeed! What a sweet little collection! Our weekend was great - Friday was our Thanksgiving shoot so the rest was spent catching up on work and relaxing! Simple and glamorous is best, and I adore (adore adore) that chevron clutch. Your weekend sounds delightful! Tacos for all! Oh my- that paella sounds amazing. I'm loving that clutch! I'm glad your weekend was filled with fun and food! Sounds like such a great weekend! And that purse?! Wow. oysters? cocktails? paella? you're the fanciest and awesomest person ever. that clutch is seriously freaking me out with how pretty it is. ahhh! i need that clutch in my life!! that clutch needs to be mine. and you had me at paella..